Global Scaling: New Term for Implosion? Scale Invariance..
Is Golden Ratio in Spectrum (Harmonic) Analysis the Ultimate Tool to Prove Global Scaling (Scale Invariance)? It is this COMPRESSION enabling principle which is behind the FUSION, COLLAPSE, SCALE INVARIANCE, HOLY GRAIL - they Seek." Implosion Group - called this "Embedability" goldenmean.info/embedability , by measurement in the 3/98 article. The Principle is Implosion- ( better term perhaps than Scaling)." 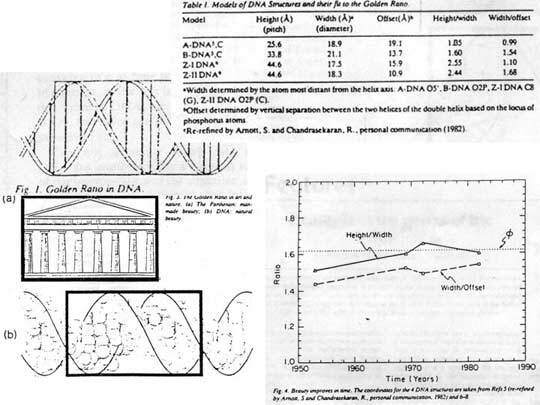 the evolution of compassion (Golden Mean in EKG power spectra), the history of BLISS (see BlissTuner-Golden Mean in EEG power spectra ) & the ensoulment (wave sustainability) of DNA etc. 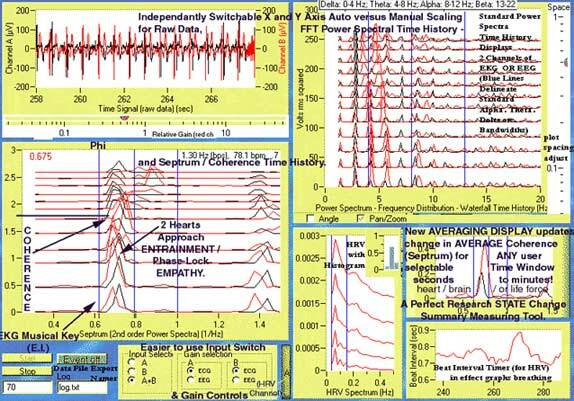 HOW this is measured (Golden Ratio spectrum analysis of EEG, EKG, Earth ELF, Hydrogen, DNA etc.) - is the subject of this article. Further - since compression of charge is the only way inertia is stored (called 'mass') - therefore this symmetry (Golden Ratio self-similarity) predicts the only path to make matter out of light. ( As predicted at goldenmean.info/predictions - Dr. Mueller was so kind from the beginning as to link on his web site). This may also suggest why PHI / Golden Ratio so closely approximates 7/5 Pi / e .
Scale Invariance , Non-Destructive Compression , Linking Gravity to Voltage, Perfect Embedding, Perfect Nesting.. (all the key concepts of Global Scaling) - -etc. math below a simple proof that Phi is the ratio that selects a sustainable (reverse) - heterodyned set i.e. for spectral coherence.. The pure principle is clearly that Golden Mean ratio is the key wave mechanic to enable scale invariance ( goldenmean.info/scaleinvariant ) , perfected recursion , self embedding ( goldenmean.info/embedability ) , perfected nesting, AND THEREFORE - perfect compression- perfect fusion ( goldenmean.info/fusion ), perfect collapse ( goldenmean.info/collapse ). We then later explained why this creates the capacitor circuit which turns compression (by Golden Ratio CONSTRUCTIVE heterodyning of wave phase front VELOCITIES) into acceleration. 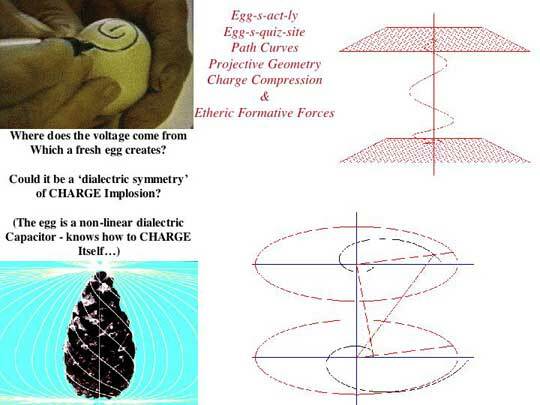 This explained why these PHI based charge circuits fabricate gravity from voltage. (since acceleration IS gravity). Thus - effectively solving the unified field problem in pure symmetry terms. These (above) Golden Ratio / pent based capacitor arrays produce a strong negative ion - ultimately leading to gravity by successful collapse. (you can feel the cool breeze). Below- for links on the techniques to measure the THRUST created by recursive capacitance- see goldenmean.info/thrust . 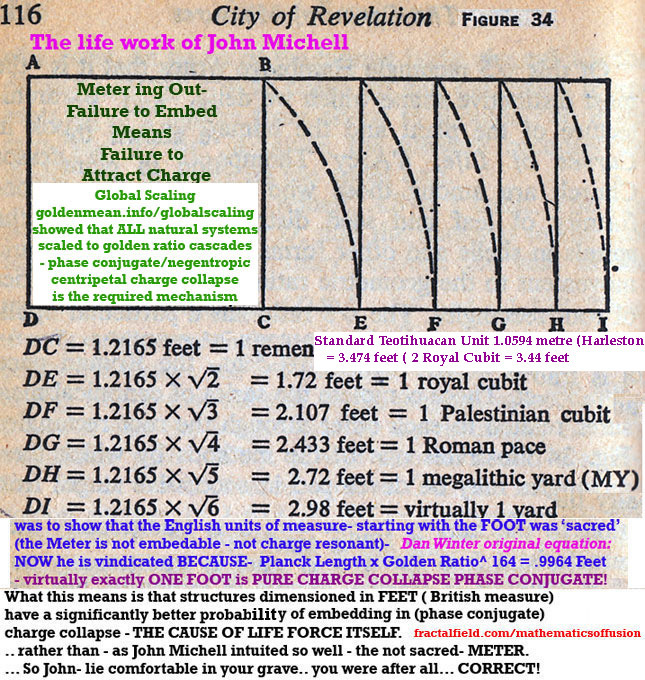 The Global Scaling movement is correct to propose that capacitors arranged in the geometry of Golden Mean ratio fabricate gravity from voltage, and voltage from gravity. But we must AVOID the danger posed by the Global Scaling idealist who still somewhat childishly believe that this is a source of "free" energy. Reference goldenmean.info/notfree . The gravity field is assembled by the recursion in the capacitive field of Earth - the work to do that is what biology accomplishes over millions of years. The ultimate leverage over that gravity fabrication is the ratio of HUMAN EMOTION, and as implemented in the ratio we install in dolmen to align the Earth grid to that embedding. quote from goldenmean.info/invasion (of Earth): (first from Swerdlow) The nexus point on any such globe is always at the 19th parallel of the planet. It is evident on Earth by the Hawaiian volcanoes, located at the 19th parallel; by the Mons volcano on Mars located at the 19th parallel; and at the red spot on Jupiter, also at the 19th parallel. 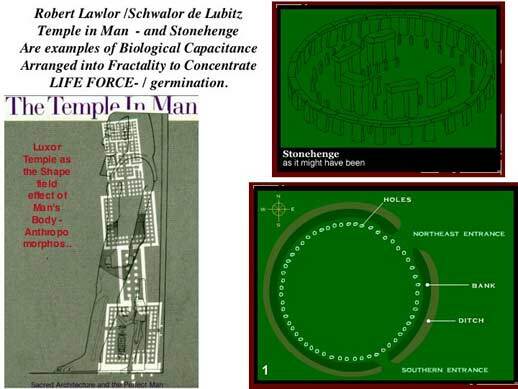 The geometry built into the monuments on Mars by the Sirians and Lyraen colonists explains about the 19th parallel through its geometric equations and measurements. 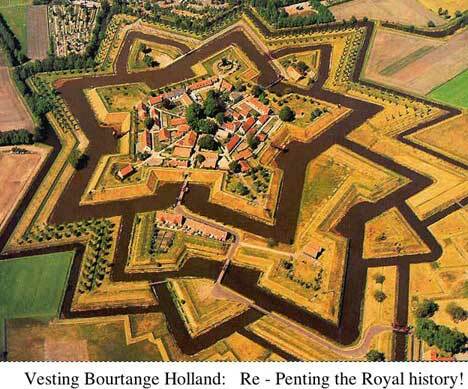 This geometry is also replicated and contained within the Giza Plateau in Egypt. Then commentary from D.Winter: Compare this to Richard Hoagland - still clue less to WHY dolmen like Giza and Cydonia are at tetrahedral latitudes. By modulating (adjusting) the spin rate of planets at tetrahedral hand holds - planetary spin comes into phase with zodiac spin- this self similar spin relation (implosive collapse) is critical to stabilizing gravity and therefore atmosphere. 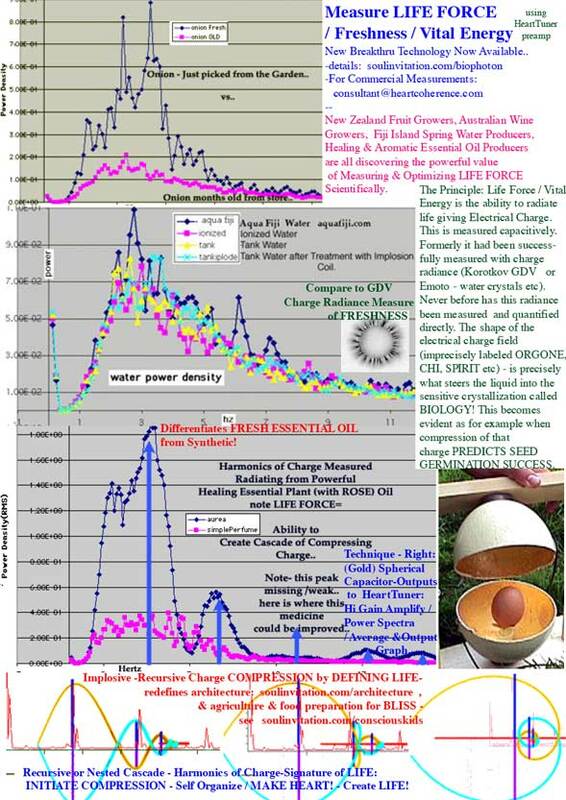 THEN -- we will understand why all those who stood near the supposed "FREE" energy devices of Newman, the PodMod, etc etc (see link) - they ALL felt NAUSEA!! SICKNESS!! So - we have a little clue to the "FREE" energy dreamers at Global Scaling conferences (like those at the hundreds of International Non-Linear Energy and Psychotronics conferences at which I have been speaker - the TITLE of my lecture at the first Internation Non-Linear Energy Symposium in DC - 20 some years ago was: WHY FREE ENERGY IS NOT FREE!). The only SUSTAINABLE solution to the human energy crisis - is biological sources of that charge attraction. And that is called BLISS - see how it is measured below . That determination of which waves are shareable to attract charge is a beautiful and natural biological mechanism - And those who ignore the rule - that IT IS NOT NICE TO FOOL MOTHER NATURE - have the privelege of testing another biological mechanism which determines which waves can compress well into acceleration and the shareable. 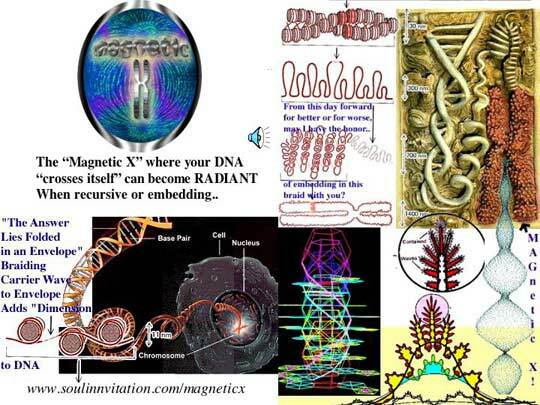 That mechanism (physics for determining succesful propagation/ immortality) is called DEATH - DNA's final squeeze. Check goldenmean.info/death . 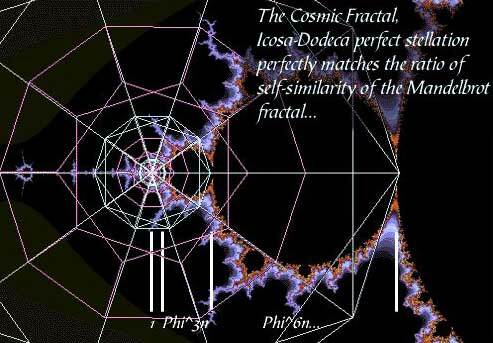 Image-from holisticarchitecture.com -no metal, perfect biologic dialectric curvature, charge conserving, life making, no sharp edges, charge compressing - all inside feel BLISS - and life propagates BECAUSE efficient charge distribution in a fractal- is the DEFINITION of consciousness. based on the new information of what shape of capacitor (non-destrucitive CHARGE COMPRESSION - see PINE CONE) causes life to happen. Self similarity produces and stabilizes gravity because that is what permits charge collapse - when the compression heterodynes by PHI into acceleration. It is as simple as understanding what creates suction when you pull to the plug to allow charge to escape down the drain (thru the speed of light). 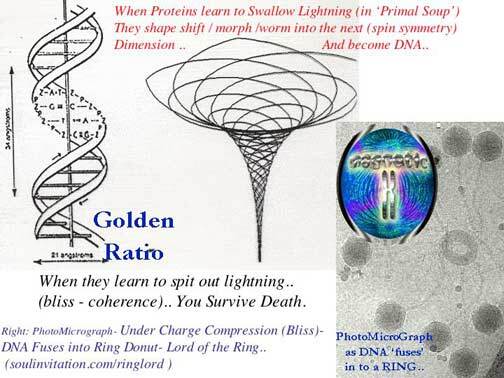 Harmonic inclusiveness (same as non-destructive charge compression & genetic diversity & scale invariance / "Global Scaling") -perfected by Golden Ratio - defines the vitality of everything that lives- as well known in the medicine of EKG ( goldenmean.info/dardik ) . 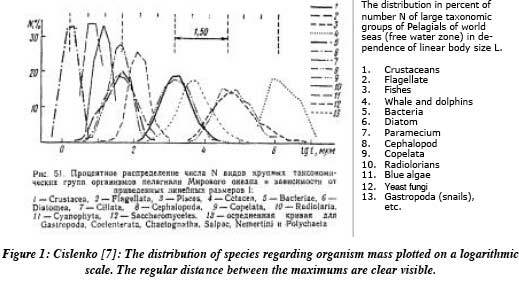 All this - then is by way of introducing experimental examples of Golden Mean ratio measures in Power Spectra (harmonic analysis ) which we suggest to be the efficient tool to prove the onset of self organization / implosion / scale invariance ("Global Scaling"). 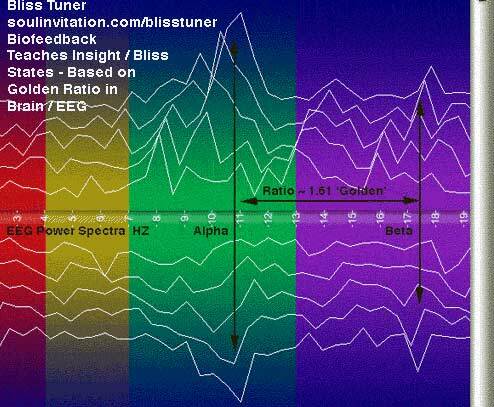 goldenmean.info/blisstuner - Article summary: the primary attractor in ratio of brain wave power spectra to indicate BLISS + INSIGHT STATES is GOLDEN MEAN RATIO in EEG primary harmonics. (GOLDEN MEAN IN HEART HARMONICS Note here: Referring to Frank of heartcoherence.com , Heart Coherence Team : He is suggesting great care in noting- altho the musical key of HeartTuner's measurement of the most - EKG reporting most empathy is at 1.618 hertz (Golden Mean numerically ) (called E.I. Emotional Index number - left blue line on screen) AND this indicates an ARITHMETIC cascade present of harmonics in the EKG Power Spectra spaced at that moment at 1.618 hertz (Golden Mean - not? ratio) apart, this cascade is an ADDITIVE cascade and not a geometric or MULTIPLICATIVE one. This means that altho the Heart IS choosing 1.618 hertz for a musical key, IT may not be correct to call this RATIO - until we determine what the science of a cascade of harmonics spaced at 1.618 GOLDEN MEAN -not ratio- between peaks. series embeds / invites a Phi-only cascade in the non-linear ("heterodyning") regime!! E - 1 = E ^ n, [n=0,1,2..] , at Phi you can see the golden sequence ""
principle in sustainable form is called "mind". below we exerpt from goldenmean.info/biophoton . Commercial use of vital force measurement based on TRUE charge radiance / spirit is already a reality. 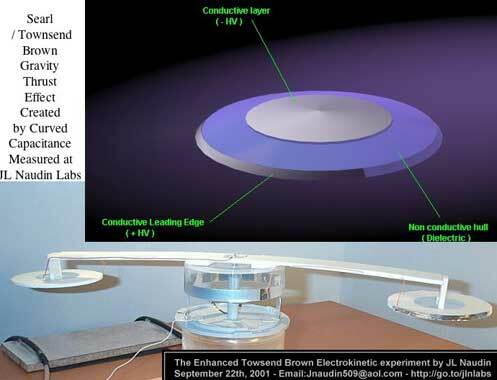 The earlier biophoton technology may become obsolete because waiting for the compressing of charge to be quantized and released as a photon is now unnecessary - and less sensitive. Life Force= equals the ability to (fractally ) attract and self-organize charge. 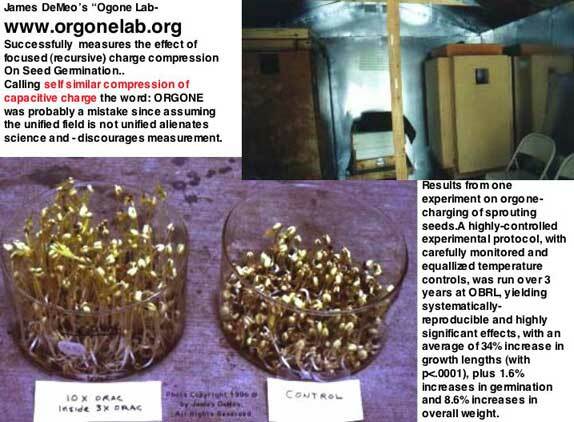 NEW!-Integrating Dr.Korotkov's Ground Breaking LIFE FORCE MEASURE USING GDV- with HeartTuner Life Force Here..
Click here to read:ANALYZING CORONAS OF FRUITS AND LEAVES , exerpted from Dr. Korotkov's NEW BOOK: "MEASURING ENERGY FIELDS. STATE OF THE SCIENCE"
Note How these 2 different technologies together - since they both measure CHARGE RADIANCE- can provide the ultimate state of the art- Measure of LIFE FORCE..! & that Data is Replicable..
Below: We are grateful to Frank- heartcoherence.com for Data harmonic analysis below - of the above Water data... NOTE: We expect to be able to isolate (and optimize) the charge sources in the environment which contribute to the life force in the water - by looking at their harmonic signatures! Rollin McCraty originally laughed when I told him his (Heart Math) Freeze Framer was merely a way to learn to breathe at one frequency. I tried to explain to him that harmonic INCLUSIVENESS - the healthy heart - was actually the opposite of getting only ONE frequency in your heart. (breath controls heart rate measureably - by setting the interbeat interval-pic below). We have long published the proper breath to make bliss - a Caducceus breath. In this breath - still point - bliss is acheived by taking a series a breaths in correct GOLDEN RATIO. The result (opposite of what Freeze Framer teaches) is what Golden Mean is meant for - getting harmonics INCLUDED. 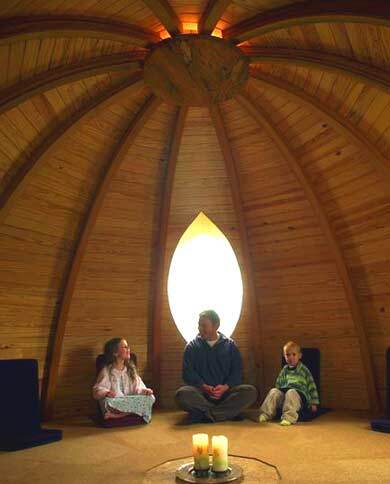 (The same still point creation is the DEFINITION of the healing moment in Sacro Cranial work). Golden Ratio in stock VOLUME analysis became the basis of Prechter and Elliot Wave Market Prediction. cup within cup, never overflows .. data infinitely compressible with no memory loss..
Summary: Global Scaling gives a new face to an old idea. Successful compression - creates.